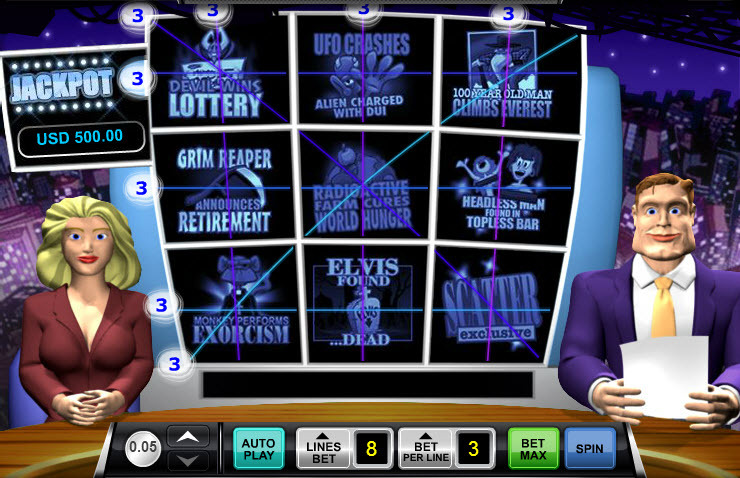 Overview: Make all the right kind of news with Headline Slots, a 3-reel, 8-line jackpot slot game. Step inside the nightly news show studio and line up the most outrageous headlines for the biggest bucks. From "Elvis Found... Dead" to "Devil Wins Lottery", these headlines definitely are eye-catching. Grab three "The Moon is Hatching" symbols in the same pay line and win a whopping 10,000 credits. Bet 1-3 coins on each line for a maximum bet of 24 credits. 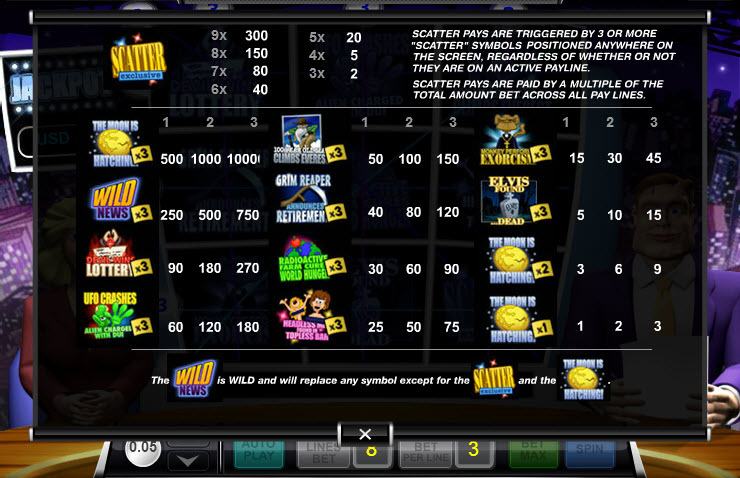 Coin denominations range from 0.05 to 5.0, and each denomination comes with the chance to win a different level of jackpot, which are relative to the coin value. The 0.05 coin has a jackpot of 500 credits, 0.25 could win 2,500, 1 could cash in 10,000 credits and 5 has the potential for a 50,000 jackpot. Also, get 3 or more "Scatter" symbols positioned anywhere on screen and grab some extra credits that way. 3 Scatter symbols will result in 2 credits, 4 symbols will pay 5 and so on until 9 Scatter symbols, which pays 300 credits. Similar Slots: If you like Headline Slots, you might like these other slot machines from Ace Gaming: Aces High, Carnival Wheel, Cross Country Reels, Deal or Steal, Freak Show, King's Castle.